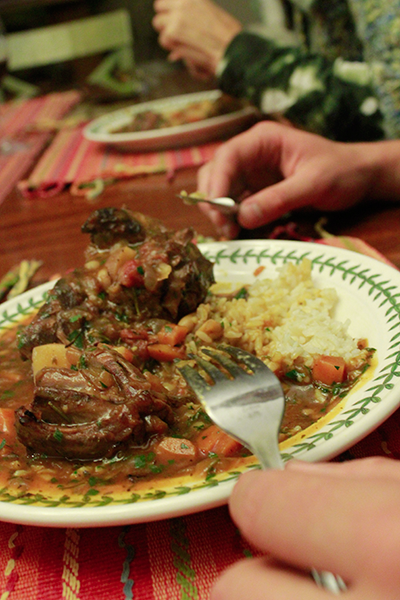 There is something dramatic about whole lamb shanks - and we had a feast of them at D'Browes restaurant at the Narrabundah Shops - Nana's treat - in 2016 and 2017. This slow-cook recipe though is my (Peter's) own. Note: This dish needs around 2 hours cooking time plus some more prep time. I add the potatoes and the beans after around 1 hour of cooking. 1. Trim excess fat and sinew off lamb. 2. Salt and sear all sides of the lamb in your pot. Or (as I do) sear over the barbecue. Both methods add flavorsome carbon notes and burn off excess fat and help dissolve the tough muscle membranes. 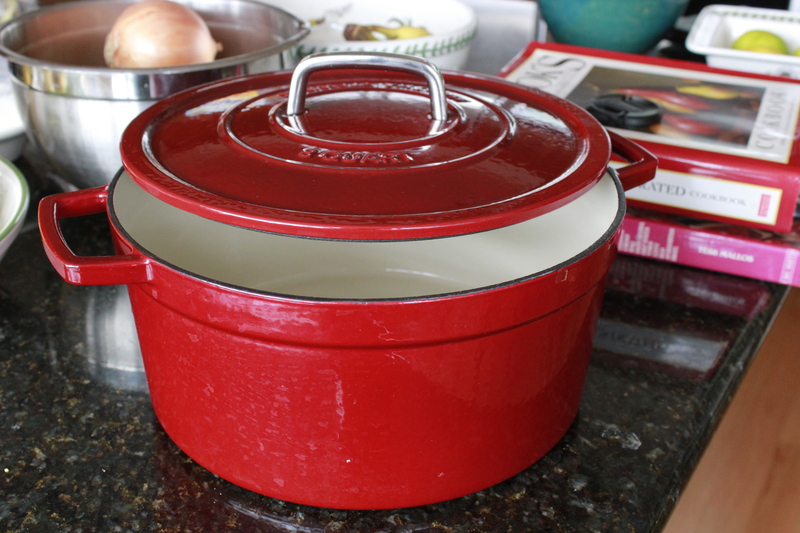 My new Martha Stewart Dutch oven (bought at a steep discount at the Black Friday sales). It can go from cook top to oven. 3. Add oil and butter to pan and add chopped onions. Cook for 10 mins or until a rich brown. 4. Add crushed garlic and carrots cut smallish. Cook for 2 or 3 minutes. 5. Preheat oven to 325 F.
6. Add red wine, chicken stock, diced tomatoes and tomato sauce and simmer. Test for flavor and add salt and pepper as needed. 7. Add rosemary and oregano (or other herbs at hand). 8. Nestle the shanks in the pot doing your best to cover them. Add a little more liquid if necessary. potatoes and beans and mushrooms (if using). Cook another 30 minutes or so. 10. Start the rice cooker. 11. 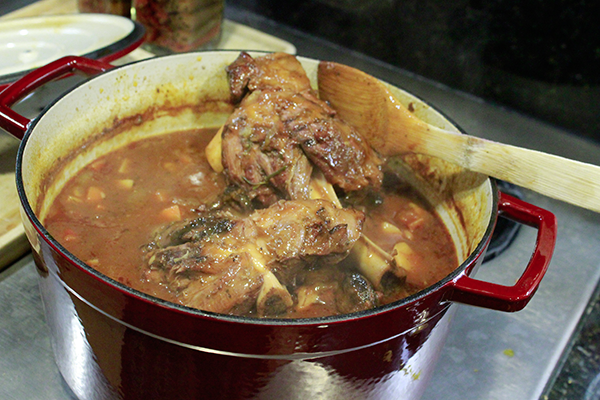 Remove pot from oven and assess tenderness of meat and viscosity of liquid. If necessary cook a little more on the cook top without the lid to boil of excess liquid and/or add 2 teaspoons or more corn flour. 12. Add mixture of lemon zest, garlic and parsley (aka "Gremolada"). 13. Check for seasoning. Consider adding: more salt, more lemon juice, more sugar, some heat. 14. 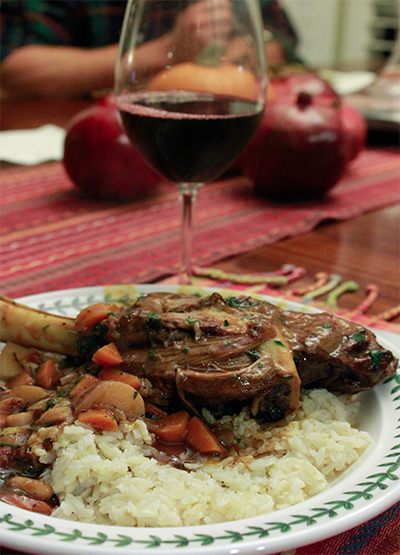 Serve with rice and red wine.